After introducing major changes in IIT Admission Process in 2013, on 24-May-2015 (Sunday) JEE Advanced 2015, stage-2 for IIT Admission Process was conducted. 1.52 Lakh students were selected to appear for this exam, although only 1.22 Lakh students were eligible to sit for exam based on various pre criteria. 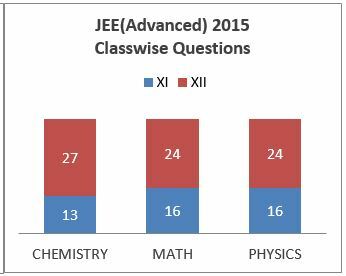 As earlier IIT-JEE Examinations, JEE (Advanced) 2015 was conducted in two parts (Paper 1 & Paper 2). Paper 1 was conducted from 9 AM to 12 PM and Paper 2 was conducted from 2 PM to 5 PM. In Paper I & II both, Total 60 Questions were asked. 20 Questions from Each Subject were asked. First paper was of 264 marks while paper two was of 240 marks. Each subject was of 168 marks overall. Total marks for both paper combined were 504. Total 196 marks questions were from class 11th syllabus and 308 marks questions were from class 12th syllabus. 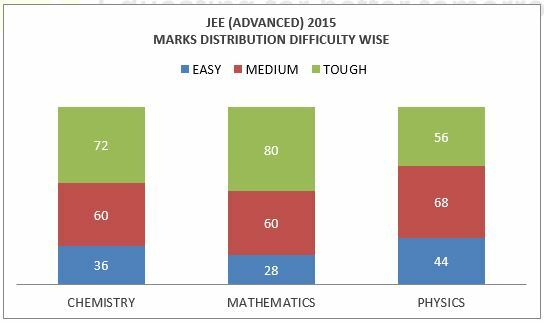 Following is the brief pattern description of both the papers of JEE (Advanced) 2015. 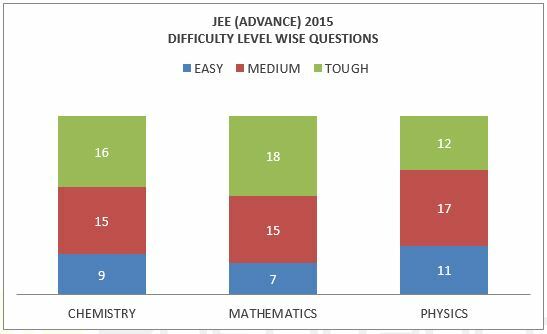 In this detailed analysis of Jee Paper we have rated every question on a scale of 1 to 3. The ratings are done by expert faculty of Resonance. The individual ratings are then averaged to calculate overall difficulty level. Resonance Experts feel that all subjects were of similar difficulty level, while Physics was relatively less tough compared with Chemistry & Mathematics. Around 108 Marks can be considered easy overall, 188 marks Moderate and 208 marks are considered difficult in the paper by Resonance Team. Overall, it is felt that paper was on difficult side. paper 1 especially was a bit more lengthy and difficult is there anyone who has a score of 400+ here? Yes, there are students with score above 400. Is there any chance cut off for obc fall to about 117. Because question was difficult and negative marking was high. 62% ques are negative marks category with -2 marks compared to 50% in 2014 with -1 negative mark. Can 31.5% rule can be removed out due to lesser no eligible candidate ?? Cut-off should remain at 31.5% (159 marks for OBC) as decided by JEE authority, Any changes, if required, will be decided by them only. Thank You Sumit. It’s good that you liked it. what are your criteria to predict a rank in JEE ADVANCED ? Previous year’s rank pattern and relative difficulty this year. i got 161 (General)&will be eligible for counselling? No the cutoff is 176. I have scored 135, category SC . Tell me which best IIT I will likely able to get and branch. I’ve got 171 and from OBC what are my chances and which college? i got 168. open cat. shall i secure any branch in any iit? and then see our college branch predictor. how many students are getting 350+ ? any idea? No Idea but according to our analysis, not more than 150 students should be able to get 350+. Your analysis is very good. According to reso .predictor…my rank is 1200 on 283 marks.can u tell me on what basis the rank has been predicted and hw accurate it is according to previous years. WE take previous year rank patterns and normalize it with relative difficulty of paper. If I am getting 282 what will be my predicted rank? As per 2014 CML, a score of 193 out of 360 in that year would have placed the candidate in Rank 3000. What do you think will be the corresponding score (out of maximum 504 this year) for a Rank of 3000 in this year’s JEE Advanced? As per JEE Board, cut-off will be 35% which comes out to be 176. How many do you think will qualify in JEE ADVANCED . Will it be more than 10,000s? As per our prediction, around 13,000 students may qualify this year. CAN I GET MECHANICAL OR ELECTRICAL OR CIVIL AT GOOD COLGS? sir i am gettiing 365 by allen keys,378 with chaitanya key and 370 with resonance keys.is there any chance of keys released by iit Bombay to be same as coaching classes key or will it change for some answers? will there be lot of changes in answer key released on june 8th? 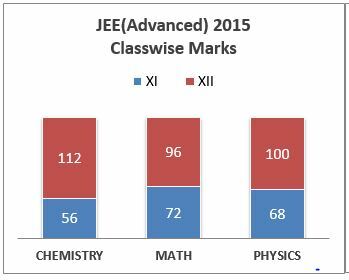 my marks in jee advanced-2015 are between 170-180.Can I be able to get a seat in IITs. Since the difficulty level of the paper is raised to an high extent and there negative marking also. should not the cut off be down this year around 140-150. JEE board has declared the cutoff to be at 35%. Making any changes or not will be entirely their decision. Since every one uses different kinds of Hypothesis, variations are bound to happen. It was importance to me, thanks author for taking out some of your precious time and sharing your thoughts on this detailed. now that the cutt off is 124 , will the predicted rank by resonance change. now what should be my predicted rank. No, the predicted rank is still the same. Since last year cutoff was 176, 19000+ students were declared qualified, this year we predicted 12000+ students will be declared qualified if the cutoff remains 176. But as now the cut off is decreased, the number of students qualified will be more than 12000.
sir can you please tell how many students likely can be there between 380 to 398? and is 380 a good score? Yes 380 is a top 50 score. If you want IITian tag go for IIT BHU. I have scored 143 marks in JEE advanced and according to your predictor rank will be at around 19000. Is there any chance to secure a seat in any IIT? Please reply, thanks in advance. If you go for placements, CS in Dhanbad can be a better choice. last year metallurgy(4 yr) last cutt off was 5800 in IIT BHU(banaras) and my rank is 6244 . This time joint counselling is happening so can i get BHU METALLURGY? Sir should i go to IIT KHARAGPUR GEOPHYSICS (for branch change) or i should go to NIT TRICHY/WARANGAL mechanical? Sir last year metallurgy(4 yr) last cutt off was 5800 in IIT BHU(banaras) and my rank is 6244 . This time joint counselling is happening so can i get BHU METALLURGY? Hello.first congrats to every student and teacher s of resonance. Does the classes provide just one year correspondence course (distance education)? I am a new comers in study for preparation of IIT jee advance and mains .my classessay have been started from 5-4-2016. In my resonance jee preparation book everything is given in short.I want to prepare excellently .so how should I study. You can refer to our DLPD study material specifically designed for this purpose.